Yamantaka (Skt. Yamāntaka; Tib. གཤིན་རྗེ་གཤེད་, shinjé shé, Wyl. gshin rje gshed) — literally 'The Destroyer or Slayer of Yama, the Lord of Death', is a wrathful form of Manjushri. Yamantaka also appears as one of the eight deities of Kagyé (see image), where he is also known as Manjushri Body (Tib. འཇམ་དཔལ་སྐུ་, jampal ku, Wyl. 'jam dpal sku). The instructions related to this form of Yamantaka are based on the so-called "four chakras": secret or abiding chakra, chakra of existence, cutting chakra, and chakra of manifestation. 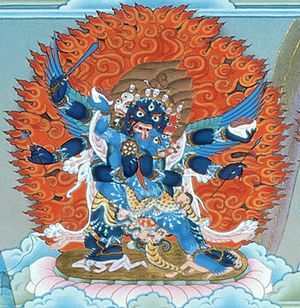 In the Longchen Nyingtik, the Yamantaka practice related to Palchen Düpa is called "Overpowering Yama, Lord of Death" (Tib. འཇམ་དཔལ་གཤིན་རྗེ་འཆི་བདག་ཟིལ་གནོན་, Wyl. 'jam dpal gshin rje 'chi bdag zil gnon). Trulshik Rinpoche, Lerab Ling, June 25th, 2003. 'jam dpal tshe bdag yang zlog me'i spu gri'i sgrub thabs rnon po nad gcod kyi dbang dbang bka' from Döjo Bumzang. "Razor of Fire", dark blue Yamantaka with three faces and six arms. This was practised by Nupchen Sangye Yeshe, who received it from Guru Rinpoche. Up to that point it was kama, but then it was hidden as a terma. 9th Khamtrul Rinpoche, Dokhampa Shedrub Nyima, Lerab Ling, 29 November 2017. Black Yamantaka torwang, from the tradition of Nubchen Sangye Yeshe, who received it from Vasudhara. This page was last edited on 13 June 2018, at 22:36.